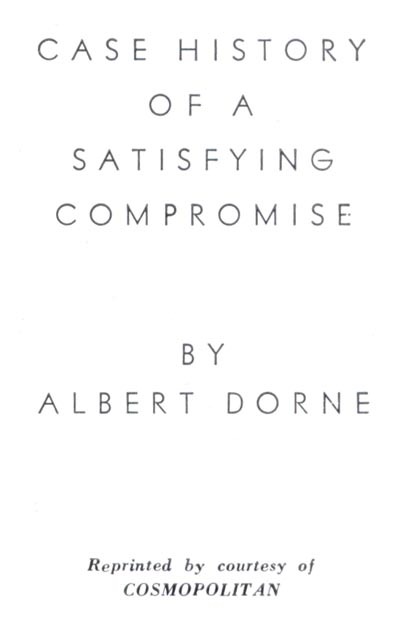 In justification of the points I have made on this "satisfaction of compromise," the following is a specific case history out of my own experience. Frank Eltonhead, art director of Cosmopolitan magazine, sent me a manuscript. Instructions were: over-all two page illustration in black and a second color - with carte blanche on choice of situations to illustrate. The locale was a farmyard at night - a fire raging in the barn. Principal characters; boy and girl, two big city gangsters and a prize cow. The audience in mind being primarily women, I knew I couldn't actually show fire, so I worked out what I thought was a successful night scene. I created the illusion of fire by lighting the picture with a deep fiery glow from "off stage." Two days later Mr. Eltonhead called and, in his customary charming manner, cooed into the telephone: "Albert, your drawing is swell but we are afraid our readers will not like it. The violent fiery red is a bit frightening, the interpretation too literal. We have found out from our readership polls, etc., etc., etc. Would you mind doing it over?" Of course I minded doing it over, I exploded. Never in my life had anything so preposterous been asked of Dorne. I was really mad. Eltonhead continued to coo into the phone. "Why don't we have lunch and talk about it?" At lunch the next day Eltonhead showed me a layout designed in a much lighter vein and quite gay in its concept. "This is the sort of thing our readers like," he said factually. "Morons," I mumbled, and I made my usual number of statements about artistic charlatans. However I turned to Eltonhead and I thundered: "Frank, I'll do this job over - not because I agree with you but because I will not have it said that a job of mine was ever turned down." With bitter resentment I did a new drawing in the way it was wanted. I sent it in with a letter which I hope has since been destroyed. I was sure I was through with "Cosmo" and equally sure that they were through with me. One morning about three months later the phone rang. Steve Dohanos said: "Al, that's a swell job in 'Cosmo' this month - fresh approach - gay - charming - you're improving, boy." I rushed out and bought the magazine and there it was, a picture that fitted perfectly with the editorial policy of that magazine and for which I have since been complimented many times by the public, my colleagues, and art directors who said: "How about doing some of that good stuff for me?" The result of that compromise was mighty satisfying. I wrote Frank Eltonhead and told him so. By the way, friends, I work for Cosmopolitan quite regularly now. I do what I want to do but I know what is editorially right for them - and the money is just dandy! * My Al Dorne Flickr set. Eltonhead wad a damn fool.Why have a brief with no restrictions and then nix an approach at so late a stage.I see Dorne as an idiot for letting it go so far and then allowing Eltonhead to cut his balls off and do the picture over. The final picture is Dorne at his worst; good technique, garbage idea.I'd like to think Dohanos's comments were ironic, but I doubt it. The question is how much BS do you take in the name of compromise?.Toth would have thrown Eltonhead out of the window because he was too good for that treatment.Maybe Dorne was so money-hungry he'd put up with anything. I'm not sure that speaks well of A.D and his 'business attitude'. I notice he recycled his characters, that must have saved time/money. Dorne was worth more than that. Wow Chad, while I respect your right to your own opinion, I have to ask; who pissed in your corn flakes today? I've spent the week very deliberately presenting Dorne's perfectly sound advice on why the successful illustrator / art director relationship should be based on compromise. Today Dorne gives us an amusing personal example of how compromise ultimately worked to everyone's benefit, and you react like this? And use, of all people, Alex Toth as a glowing example of what one ought to do in such a situation?!? Alex Toth, the guy who pissed off every client and friend he ever had to the point that he had no choice but to spend the last good years of his working life churning out storyboards and character designs for the approval of lowest common denominator tv executives at the Saturday morning cartoon factory! That's the shining example of "artistic integrity" you're going to hold up to counter Dorne's philosophy of how to behave like a professional? Please, man, tell me you've got something more reasonable to add than "here's what Alex Toth would have done!" Btw, for a commercial artist, money is not the enemy - its a principal motivator. And being hungry for it is an asset, not a liability. Dorne's second painting looks to me to be similar to an Al Parker sort of painting and layout,with outlines instead of full rendering,minimal background,floating decorative type ,an obviously comical cow,and emphasizing the boy-girl interaction.It fits a comic story better than the first one,which would make a dramatic and effective illustration for a straighter adventure story.Not that there isn't comic stuff in both,but the humor is brought forward in the second one. Leif,I think this might almost be considered one of Dorne's 'romance' illustrations.I wonder if he was spoofing Parker and the others a little bit,while meeting the requirements of the assignment. Leif,I'm all for compromise and collaboration beteen Art Director and artist,but this homily from a great talent like Dorne,for me,sets the wrong example.If Dorne, with all his, clout says this is what you should do, then illustrators at the lower levels run the risk of being bullied and exploited by some ADs and accepting it. I use Toth as an example of someone who showed a bit of backbone and did not put up with it.His anger problems are well known but he was always in work because he was REALLY GOOD. There were any number of publishers, big and small, that tried to persuade Toth to carry on, willing to publish anything he weanted to do,but his heart wasn't in it anymore for personal reasons. Those are the real facts. I admire Dorne, but I think his personal predilections were at the root of this ill-judged advice. I also draw a distinction between hunger and gluttony. Well put, Steve; I suspect you're right - it would be fun to actually know if dorne wa spoofing Parker et al with his take on the "new style" of romance illustration. What it does show, as you point out, is that Eltonhead recognized that the Parker - style of page layout; that then-new "big head", flat perspective , graphic designy approach was selling extremely well with Cosmo's audience, and what's so keen about Dorne's second pass is that he adapted so completely to what was asked of him. When you look at some of the other work he had done over the preceding decade (many of the examples presented this week) you have to respect his adaptibility. And clearly, from Dorne's point of view, it was one of those marvelous surprise moments in the life of an artist, when you've been plateauing for a while and are suddenly jolted upwards by an unexpected development of style or technique. Suddenly the work becomes exciting again! And that's what can be the happy incidental effect of compromise. I can see where you're coming from now, Chad, and I respect that. This is the point where we all have to choose our own threshold for compromise, collaboration, whatever term suits you best. Dorne had his own set of life experiences that influenced his attitude and you have yours and I have mine... I suspect you admire Toth's unwillingness to bend because you see it as a sign of strength and integrity. One could perhaps compare him, personality-wise, and philosophy-wise, as being more closely related to Robert Fawcett. But from a business perspective - and I emphasize again that we are talking about commercial artists - Toth was a stubborn troublemaker and Dorne was a reliable professional. There may be room for the Toths and the Fawcetts in the business world, but its the Dornes and the Kirbys (and Buscemas and Romitas) who grease the wheels of commerce. Re: hunger vs. gluttony? 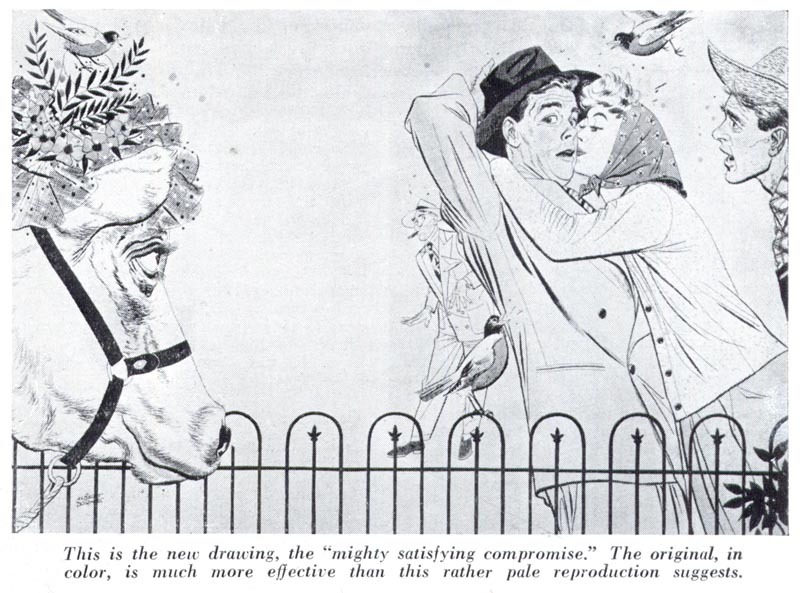 Good lord, man, if there's one thing the illustration business needs its more gluttons! At the rate we're going (since Dorne's day) we'll all soon be giving our work away for free for the honour of being published. Oh yeah, that's right, we're already there! I feel more sadness than excitment from this example. This isn't compromise, it's giving in. In DVDs we get to see deleted scenes of a film, but we don't get that luxury in looking back on illustrations such as this. Most are lost forever. It's a pity that the public doesn't get an opportunity to make their true opinions known over the "cooing" of an AD or their insulting preconditions by assuming their customers are idiots. If Dorne was proud of his compromises, then I hope he cashed his checks with a smile. It doesn't take talent to make money. The skill comes from making it feel worthwhile and not losing your soul in the process. 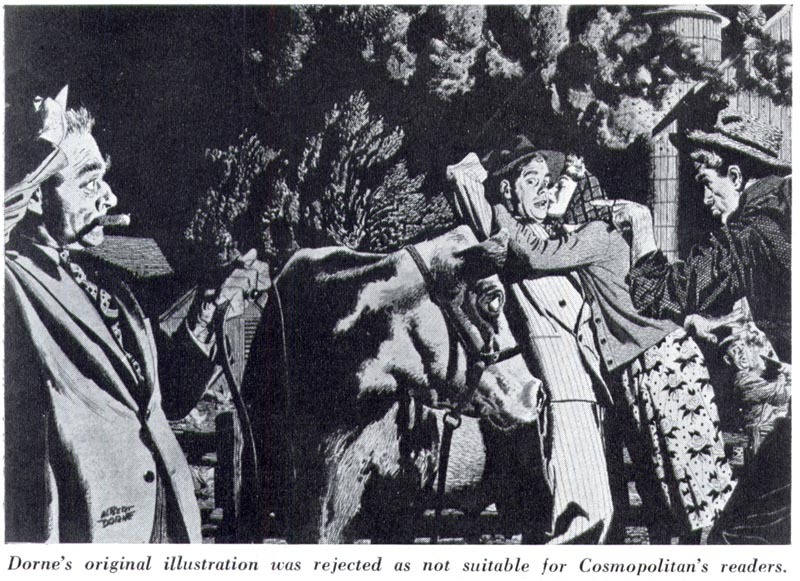 A sad-eyed cow with a flowery hat on was preferable to the dramatic night scene? So I take it that the average age of the Cosmo reader then was about 6 to 9 years old. "Of course I minded doing it over, I exploded. Never in my life had anything so preposterous been asked of Dorne. I was really mad." Let's be honest.Dorne's first reaction was the right one.And he knew it.I hope he continued to stay away from that "violent fiery red", lest he scare his readership. Jeez, how are you going to get along in this world without occasionally compromising ? The choice for Dorne was simple - lose an a-list client or be a professional and risk trying something new. I have been reading this weeks' blog entries only this evening. I started to read the above entry with vague scepticism toward the main 'promulgated' thesis. But, for what it's worth, I'm very pleased with this case of 'compromising': if only all artistic compromises would have ended so well! The editor's complaint looks quite valid: I don't need any polls to realise that Dorne's original, dramatic drawing is simply not right for the leisure time of a female audience. The published drawing contains a lot of humour, judging by today's standards of one consumer, myself. It's certainly not a work of a spiritually defeated artist forced to produce blandness. What seems to have been left unsaid is that the artist and the art director may, in conversation, clarify their thoughts so well that they arrive at a 'third idea,' better than their previously held ones. However, I've no idea whether, or to what extent, time and circumstances allow this possibility. All is easier if one is aware, you serve an ideal bigger than yourself. That makes refusal also easier and more coolheaded... That's what I think. Here's the thing.Robert Fawcett was 'the artist's artist', the illustrator admired by all his peers.A man driven to the highest levels of perfectionism.And Alex Toth was 'the artist's artist' in the world of comics. My belief is that their brilliance stemmed from their personalities.Difficult, yes, because they cared -violently-about what they did.That level of commitment is difficult for others to understand and it is only when you review their body of work that you begin to see how their uncompromising attitude lay at the heart of their work. I don't blame these guys for 'being difficult' with Art Directors, they were difficult with themselves,it goes with the talent.Like it or not. How dull would our industry be without genius/mavericks like these to set the standards? Mr Dorne had his own philosophy that the ends justify the means.That's fine but as good a draughtsman as he was his work will never be touched by true genius.I guess its all about what you expect from youself and the final judgement of your peers. I think that's perfectly acceptable, Chad. Everyone needs to be comfortable in his own skin. But not everyone can be a genius - and one could say that Dorne was a genius at the business of illustration ( again, I think its imperative we recognize that illustration is a business) and that by that standard both Fawcett and Toth were abysmal failures. 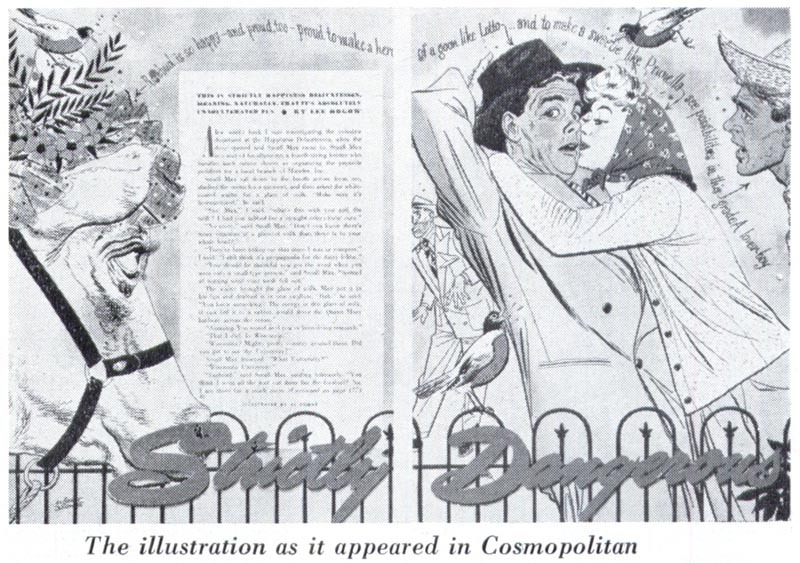 Fawcett, as we know from David Apatoff's article in Illustration, often got work only because he was so respected by art directors and fellow illustrators like his friend Al Dorne, who would advocate for his hiring. The public didn't find his work particularly appealing. Toth suffered from similar circumstances. Were these two perhaps fine artists trapped in illustration careers? Maybe that kind of genius is a curse as much as it is a blessing. At the risk of sounding pompous or elitist, I would rather have the approbation of my peers than great public popularity. I think there's something nice about recognition from others in the same game. It would be tempting to want both though! And I think bringing a fine art attitude into the commercial arena adds a certain spice to the industry-ie being slightly at odds with popular attitudes. Yeah, I can't disagree with that at all. I recognize the value that someone like Robert Weaver brought to the field even if I don't care for a lot of his work (although I like some very much). Those uncompromising mavericks often show the rest of us the way to something fresh and exciting which we might never have considered. Like Toth, they can end up being a powerful stylistic influence on others who come after them. But for the sake of that majority of illustrators who will never be Fawcetts or Toths or Weavers, I think its important to understand the value of what Dorne was attempting to teach: you can enjoy greater success (and thus a better quality of life) if you learn to compromise with the client. And the input and direction of your creative partners ( i.e. art directors, designers, editors ) can lead to growth that you might not have realized on your own. Hopefully there can be a balance between the individual artist's need for personal expression and the client's need to sell their product to that market segment they understand best.